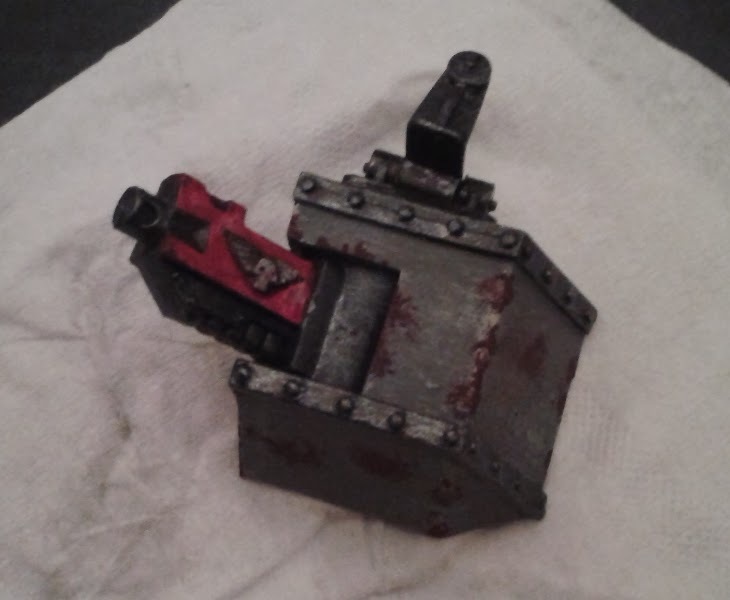 Here's a quick how-to on creating a weathered effect for tank models. I can't claim to have developed this technique - I stole it from the amazing work of Kris Belleau from miniwargaming.com. 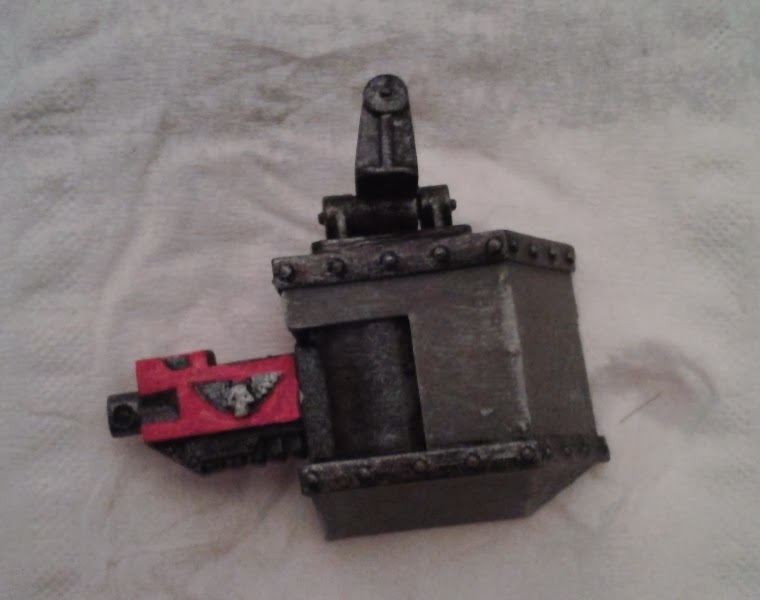 It's lifted directly from a video he produced for the MiniWargaming Vault on how to paint a Blood Angels Storm Talon model. Thanks, Kris! 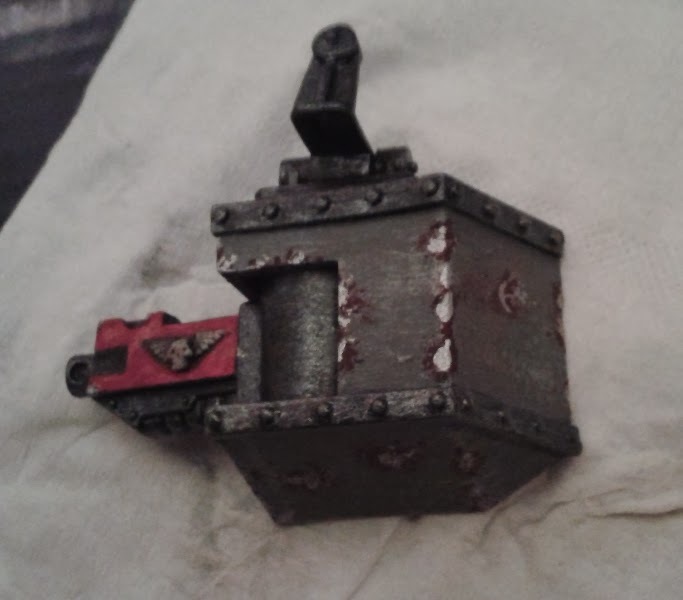 I'd never weathered a tank model before but wanted to apply a weathered look to my Imperial Guard. This decision was made whilst I was working on my Baneblade model, the painting of which is covered here. At the time of writing this guide, I've tested the process but not yet applied it to the Baneblade. If you followed the Baneblade link and found an "off the Mars production line" looking model, check back again in a couple of days! some open-cell sponge (the sort of stuff minis in blisters come backed with). something to hold the sponge with - tweezers, pliers etc. some silver paint (I found that quite bright silver worked best). Paint your tank to the finish you want including all highlighting and decals. This method needs to be applied post-painting but before application of any pigment powders if you're going to do that. Tear off a small (and I do mean small) piece of the sponge. Make the edge as ragged as you can, but try to avoid stray wisps sticking out. Grab it with the pliers/tweezers. I used a rubber band to hold the handles closed - no point in developing cramp whilst working. Dip it in the brown paint - don't completely smother it, but don't under-do it either. Test it on a bit of paper - make sure you can transfer small, ragged blobs to the model. Apply to the model - target primarily edges and corners - anywhere paint might get scuffed. Using a fresh bit of sponge, repeat the process with the silver paint. Target the same places you've already hit with the red-brown and try to make your impressions overlay the brown areas (so there's just a suggestion of brown left beneath it). If you overdo it with the silver, dab on a bit more red-brown. You can fine-tune that with more silver if required. Remember - the silver should come out as the dominant colour or your model will look like it has "leopard-spots". And that's it! I found it best not to try to be too precise with the silver paint - the whole point of using the sponge is to get a sort of randomness to the application. Here's the third instalment in my series on getting Blood Bowl miniatures ready for an upcoming game. This time it's a referee. There are no longer any rules for referees in Blood Bowl (there used to be back at 2nd Ed. IIRC) - this guy's just for fun. This little chap is not a Citadel Miniature - he's made by an Australian company called ShadowForge. This will be the last Blood Bowl post for a few weeks whilst I decide what to paint next. It's either going to be Elves or Skaven - I'm mulling it over and will post again when I've decided and finished the job. Here's the second instalment of my progress reports on getting some Blood Bowl miniatures which have been sitting in a box for far too long ready to play. I'm undecided at the moment about what team to paint next now that my Orcs are done, so I'm doing a couple of "single" minis whilst I think about it. Here's an Ogre model I've had for a while. I'm really pleased with the result on this guy - he only took about 90 mins (not including the time for the black spray basecoat). Bloodbowl: Orc team "Orcrington Stabley"
As sanity-saving interlude between working on big modelling projects like my Siege models and preparing whole armies for "the next game" I thought I'd catch up on some smaller pieces of work I've been neglecting for some time. This also helped the household survive the inevitable "space crunch" which occurs at Christmas time as "all my crap" (a technical term my wife uses to refer to my wargames hobby) needs to make way for large trees and piles of presents. I decided one of these mini-projects would be to pick up some work on some long-neglected Blood Bowl models, starting with an Orc Team. I'd tentatively named them "Green Dark Raiders" just for the sake of the pun on the English team "Queens Park Rangers" until my friend Mike came up with a much better pun. There's a lower-league team in the English soccer league called "Accrington Stanley". Hereinafter, this team shall be known as "Orcrington Stabley". Thanks, Mike! I enjoy painting Orc skin-tones and I wanted the skin to be the most eye-catching thing about this team. I make no apologies for the 1990's Orc skin-tones by the way. I've always preferred the warm "Goblin Green" basetone to the colours that people tend to use on Orcs these days. Sorry if you think it's a bit "old-school" or dates the models a bit. I like it. So there. Most of these models come from the 3rd Edition of the game (circa 1994) which I picked up from Warhammer World in about 2006 where it was still on sale as a "Specialist Game". The model front-and-centre is a 1st Edition Blood Bowl metal model. The front-right model comes from a GW game called "Kerrunch" which was released as a sort of "rules-light, budget intro" to their games in 1991.